OVERVIEW When you can receive notifications and calls right on your wrist with Samsung Galaxy Watch, you’re always connected. Whether you’re cycling, swimming, squatting or sleeping, the Samsung Galaxy Watch automatically detects and monitors your activity. Offering a range of technological advancements compared to standard timepieces, the Andriod smartwatch provides a fantastic range of features for wearable tech fans. Andriod smartwatches are available in a range of styles from fashion to function and are compatible with many smartphones on the market. 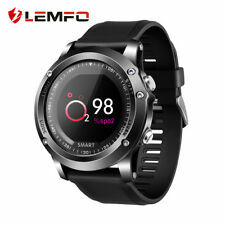 You'll find a variety of popular styles from leading brands including the Samsung Android Smart Watch plus other brands including Huawei, Sony and LG plus many others. Each offers a durable and practical watch for busy lifestyles. Often a more affordable alternative, unbranded or generic smartwatches offer the same practical aspects just without the brand price tag. Andriod smartwatches offer the latest in Andriod Wear, which is compatible with a host of operating systems in many modern smartphones. You can personalise your experience with different displays so you can select important apps or information straight away. Similar to your smartphone, Andriod smartwatches offer features such as Google Assistant so you can find information quickly and efficiently. Other impressive functions include storing all your favourite apps, so you have everything you need at the touch of a button. Similar to other wearable technology, you can also use Andriod Pay and Google voice control plus make calls and check emails all from your wrist. For a practical and intelligent fitness tracker, an Android smartwatch is an ideal option. There is a large selection of comprehensive watches that help you track everything from walks, runs and fitness training plus other monitoring features such as heart rate. There is also a range of options for fitness coaching and playing music to help get you motivated. Fitness trackers are often made from flexible material such as silicone as they offer a comfortable accessory for active lifestyles. There is a range of smartwatches to suit a variety of tastes and styles. From functional fitness watches with weatherproof materials to fashionable smartwatches that pair beautifully with a range of daywear and evening wear looks.